Android market is growing in India with the tremendous speed. As a result, Google India is working hard to bring many services for India users. Google India has just launched the Turn-by-turn navigation and live traffic updates, both of these features are now available for Google Maps users in India. Google Maps Navigation (Beta) is a free service and can be accessible to any Android Smartphone running Android 2.2 or later. Google Maps Navigation is an internet-connected GPS navigation system with voice guidance. It takes advantage of mobile internet connection and Google map data to help you show correct route. No matter where you’re heading in India, Google Maps Navigation will guide you to that place. While driving in the car, you don’t need to look on maps because voice assistant will announce upcoming directions as you move along the route( for e.g Turn Left, Take U Turn). And yeah most important thing, Navigation is familiar with Indian accent and will pronounce the place correctly. Google Maps will also begin to offer live traffic information for major roads in six large Indian cities and their surrounding suburbs: Bengaluru, Mumbai, New Delhi, Chennai, Pune and Hyderabad. The Information shown in simple and readable color: Red for Traffic jam, yellow for minor traffic and green for free-flowing traffic. 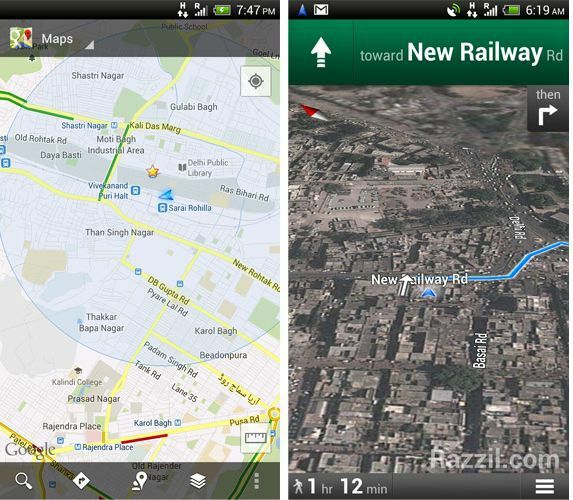 All android phones in India come with the Google Maps package preinstalled with the device. Before we start the app, first check whether GPS is enabled or not. Go to ‘Settings’ > ‘Location’ > Tick mark ‘GPS satellites’. If you’re Android 4.1 Jelly Bean users than Google Maps Navigation is also available for ‘Google Now’ traffic updates card. Helllo there when is Samsung Galaxy note 2 gonna come to india and when is he Android 4.1 Jelly Bean update is arriving for Indian Note users.